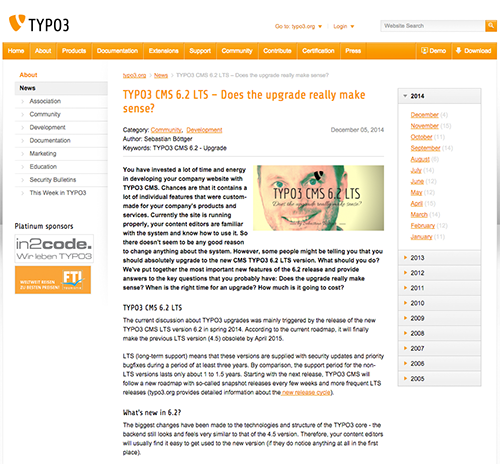 typoblog / TYPO3 / TYPO3 CMS 6.2 LTS – Does the upgrade really make sense? You have invested a lot of time and energy in developing your company website with TYPO3 CMS. Chances are that it contains a lot of individual features that were custom-made for your company’s products and services. Currently the site is running properly, your content editors are familiar with the system and know how to use it. So there doesn’t seem to be any good reason to change anything about the system. However, some people might be telling you that you should absolutely upgrade to the new CMS TYPO3 6.2 LTS version. What should you do? We’ve put together the most important new features of the 6.2 release and provide answers to the key questions that you probably have: Does the upgrade really make sense? When is the right time for an upgrade? How much is it going to cost? The current discussion about TYPO3 upgrades was mainly triggered by the release of the new TYPO3 CMS LTS version 6.2 in spring 2014. According to the current roadmap, it will finally make the previous LTS version (4.5) obsolete by April 2015. LTS (long-term support) means that these versions are supplied with security updates and priority bugfixes during a period of at least three years. By comparison, the support period for the non-LTS versions lasts only about 1 to 1.5 years. Starting with the next release, TYPO3 CMS will follow a new roadmap with so-called snapshot releases every few weeks and more frequent LTS releases (typo3.org provides detailed information about the new release cycle). The biggest changes have been made to the technologies and structure of the TYPO3 core – the backend still looks and feels very similar to that of the 4.5 version. Therefore, your content editors will usually find it easy to get used to the new version (if they do notice anything at all in the first place). As older versions of server operating systems, PHP and MySQL are not supported by their manufacturers anymore, TYPO3 also drops support for these legacy versions in order to allow for cleaner and more efficient code. TYPO3 CMS has been optimised for implementing responsive web design and barrier-free web sites. Does an upgrade really make sense? As a basic principle, it is always a good idea to apply software upgrades. Any software vendor releases new versions/updates of their software in more or less regular intervals in order to eliminate security risks, fix other bugs, and improve the software with new features and technologies. As initially mentioned, support for the 4.5 LTS will end in April 2015, and it already has for the non-LTS versions 4.6, 4.7, 6.0, and 6.1. Meaning, that if any bugs or security issues occur after this date, there is no official commitment that those will be fixed. As a result your system is exposed to a considerably higher security risk. Thus, it´s also more likely that malicious users gain unauthorised access to your server. The consequences of a hacker attack are mentioned daily in the media: web servers are abused for spam and/or criminal activities, web sites become unavailable, sensitive data gets into the wrong hands, and so on. And this does not only happen to high-profile websites – many attacks are done by programs that scan millions of web servers for known vulnerabilities requiring little or no manual interaction on behalf of the attacker. However, should a really serious security issue regarding the core occur, you can be sure, that there will be patches for the older versions even without official support, as in the case of „jumpurl“ a few years ago. I don´t wanna say, that by upgrading to 6.2 your system is completely secure and protected. The relation between core security bugs and extension security bugs is somewhere between 10 to 90 percent. Thus, the new version probably has security issues we don´t know about yet. But one thing is for sure: 6.2 is way safer than the older versions. DAM is a TYPO3 extension that allows to manage so-called assets, such as images or documents, and edit their metadata. This extension does not work with CMS 6.2. The reason for this is that the TYPO3 CMS core now includes its own asset management system, the File Abstraction Layer (FAL). However, FAL is not a direct successor of DAM—it merely provides the technical infrastructure for asset management and does not include a backend module for advanced file browsing and metadata editing, although there are extensions (most notably the new “Media” extension) to add this functionality again. It does include an assistant to migrate existing DAM data into FAL, but in most cases there’s still some work to do after this automatic migration. One of the great advantages of TYPO3 CMS is its large number of extensions that are free of charge and can be adapted individually. Many companies also use extensions that were developed especially for their needs. In both cases, the extensions need to be adapted to the new core version in order to continue working. The TYPO3 team does a lot of work to adapt the most commonly used extensions. But they can’t take care of every single extension ever made – which means, that some extension ultimately stay outdated and won’t work with the new core anymore, often making the entire system unusable. In order to restore the functionality of all extensions (especially less popular ones as well as those made specifically to your company’s needs), your own development team or the supervising agency will have to put some extra work into it. Hence upgrading to TYPO3 CMS 6.2 is not just about installing the new core version—in many cases, restoring the compatibility of all extensions turns out to be the biggest cost factor. Since you are already putting time and money in getting the extensions running, it may be useful to take the opportunity and make a clean up. In the event that your are using a lot of self-written extensions, it might be worth considering to refrain from upgrading and turn to relaunching your website. If the relaunch is a real alternative, you should consider using TYPO3 Neos. The two CMS co-exist side by side, each with its own niche and purpose. When it comes to the simple presentation of content, where editors are happy and no complex business logic need to happen in the background, Neos is a good option. If the focus is more on large amounts of data and logic, CMS is still the system of choice. Do I really have to upgrade now? Of course you don’t really need to do anything. However, you must be aware that substantial additional costs will occur if you keep on using one of the older versions and decide to upgrade later to an even newer version – this will almost certainly require an intermediate step via 6.2 anyway. Besides this, TYPO3 CMS has become significantly more developer-friendly between 4.5 and 6.2, which means that sticking with old versions makes continued development and maintenance of custom extensions unnecessarily expensive. The biggest risk however are security issues that are found after the end of the life-cycle and don’t receive fixes anymore. What alternatives do I have instead of upgrading? The question should rather be: when should you refrain from upgrading? If, for whichever reason, your company’s IT department only allows one particular version of one particular browser, you should check before upgrading whether it would still work with the new CMS version. If this is not the case, you might need to employ a very good developer or to pay an internet agency for maintaining this obsolete version of TYPO3. The older your TYPO3 version is, the more expensive this maintenance will be. Can I skip the 6.2 version and simply wait for the next LTS? If you still want to work with TYPO3 CMS in the future, you can’t skip the 6.2 LTS version. Upgrading from one LTS version to the next should be a relatively smooth task as long as your developers stick to the standards. For the change from 4.5 to 6.2 there is a migration wizard that supports the upgrading process. However, if the system or even database structures were significantly changed, everything gets more complicated. If your site and your custom extensions heavily rely on DAM, an update can get really expensive. How expensive is an upgrade to 6.2? The new version has technically changed a lot – especially the code. The misleading part about it is that this is not visible from the outside. In addition to the update of the core, scope and complexity of the works very much depend on the extensions in use. Thus, first of all, you need to analyse all aspects of the existing system to make a concrete estimation of the work that needs to be done. One thing, however, can already be said: Yes, the upgrade will be more expensive than the migration from 4.5 to 4.6. This time it is a bit more complicated to bring the system technically up to date. But you need to look at it this way: It’s like the maintenance of technical equipment. Machines are checked at regular intervals by an expert to ensure the proper functionality for the term of the next maintenance period. Regarding the LTS version, this will be for the next three years. TYPO3 CMS has provided a stable and reliable new LTS version. The system is technically up to date and ready to meet future challenges. Not to mention the impressive number of more than 2,000 bugs that have been fixed. From our point of view, an upgrade to 6.2 makes sense in any case. To facilitate the upgrade process and assist in upgrading core and extensions, the developers of TYPO3 CMS have put an immense effort in the creation of supporting tools and documentation. If you opt for a clean upgrade or a relaunch on 6.2, you will be rewarded with future-proof technology, updates till 2017 as well as the fact that the cost of running the website will be kept under control for the next few years. “Clean upgrade” means that an actual modification and – if necessary – rewriting of the extensions takes place, and not making the extensions somehow run again. This is of course possible as well, but only postpones the problem. You certainly want to invest your money rather in the maintenance and further development of your website, than having immense costs for bug-fixing. typovision competently and professionally accompanies the process of implementing the upgrade to 6.2. By commissioning us to analyse your TYPO3 system, we can submit a concrete offer. If you decide to have us perform the actual upgrade, the price of this analysis will be deducted from the price for the upgrade. We are happy to receive the news, that our article aroused that much attention, that it was published on typo3.org. Many thanks to Olivier Dobberkau & Naike Schulthess for the support! Sebastian launched his first internet company, a car sharing platform, while he was still studying (diploma in computer science). 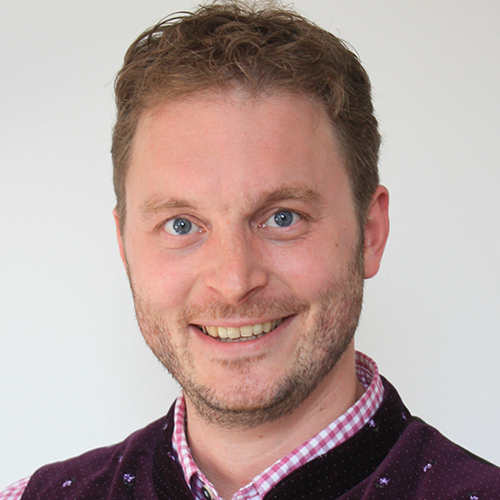 After working six years as an IT freelancer, he founded Cross Media Content GmbH in 2010, which was renamed to typovision GmbH in 2012. Today typovision is an established Munich-based agency specialised in open source technologies focused on TYPO3, Shopware and Apache Solr.